Recorra sin esfuerzo Calgary y descubra su belleza en este recorrido de 90 minutos en Segway. En un corto período de tiempo, recorra el centro de la ciudad y vea la famosa cuenca del río en Calgary. Admire el río Bow y el sendero Trans Canada, el sendero continuo más largo de América del Norte, así como la catedral de San Patricio, Fort Calgary e Inglewood. 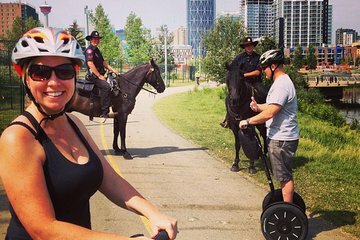 Esta excursión en Segway por Calgary está limitada a solo siete personas, lo que asegura una experiencia aún más inolvidable. Tour en grupo pequeño limitado a siete personas. Conozca Calgary de forma rápida y fácil con este recorrido guiado de 90 minutos en Segway, disponible a varias horas del día. Esta excursión recorre el centro de Calgary a lo largo del río Bow y del sendero Trans Canada, el sendero continuo más largo de América del Norte. Deslícese por la recién renovada Isla de San Patricio, el histórico barrio de Inglewood y Fort Calgary. Tanto si va a tener una interesante cita o a realizar una actividad familiar, no se pierda esta aventura en Segway. Comience con instrucciones detalladas que empiezan con un breve vídeo de seguridad antes de recibir formación práctica de un entrenador en Segway certificado. A continuación, siga a su guía a través de la cuenca del río en Calgary y empápese de bellísimas vistas. A lo largo del camino, disfrute de oportunidades fotográficas y ayuda de su guía, según sea necesario. Nota: es necesario un mínimo de dos personas por reserva. This has taken me some time to post but we had the most amazing time on this segway tour, took us all over the place and parks it was a lovely way to see all the places that we could go back and visit later on. would defiantly do this again had the best time. This was a real fun thing to do and the guide was excellent and very soon put us all at ease and he kept stopping to explain things along the way. When we got off we wanted to do it all again. There were no sights to see/enjoy! It was a - sorry - boring tour. The guide was really very nice. But the tour was very boring. I wouldnt do it again. There were no highlights. The driving was very very slow. We made a tour in San Francisco, this one was great! And in the 90 minutes there was half an hour explanation included, so at least we had 1 hour to drive around. In San Francisco the explanation was excluded of the time you went on tour! Was so much fun! My husband and I got lucky and we were the only ones on the tour. Pete our tour guide was fantastic. I would have loved to tour the whole park with the Segway. Peter was very patient with my wife and I since we have never been on a segway. We went through safety checks to make sure we didn't do anything to hurt ourselves on the rest of the trip. We had a great time, mastered what we were taught, had a good history lesson of Calgary, and had an overall wonderful time. Would recommend it without reservation. The tour guide did a great job preparing us to ride the Segway machine. The ride along the Bow River was awesome. Had a great time.